A trip to Los Angeles means soaking up the sun, checking out local museums and of course eating at unique restaurant experiences in DTLA. If you don’t know where to start, read on to learn more about places you’ll only experience in Los Angeles. Clifton’s is a perfect example of something that is unique to L.A. This location is a classic cafeteria style eatery that has been around since 1931. Over the last few years, the place has gone over a total makeover making it better than ever. Some of the things you’ll want to keep an eye out for include the giant faux redwood that rises through all five floors of the building as well as the other trees that decorate the interior of the building. While the first floor is the cafeteria, the other stories turn into a bar and dance party at night -- be sure to keep an eye out for the secret tiki room upstairs! 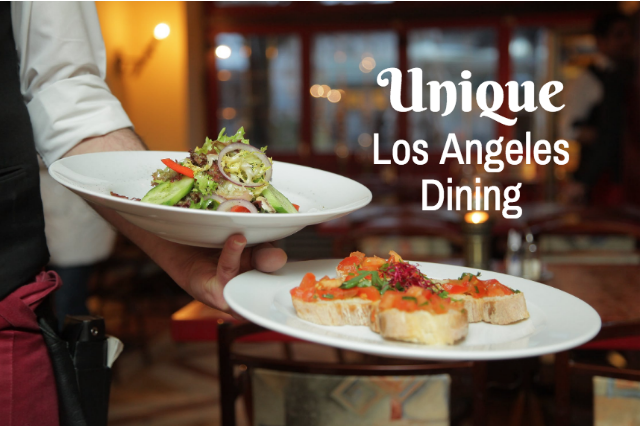 Want to eat at the same place that was once a gathering place for the stars during the Hollywood golden age? If so, head to Yamashiro Hollywood, a sushi/Cal-Asian restaurant that is perfect for a romantic night out. The restaurant, which is located amidst the Hollywood Hills, is complete with stunning views of downtown L.A. below, Japanese style gardens and even a koi pond. The restaurant was built in 1911, as a replica of a Japanese palace. Inside, enjoy sushi, sashimi, filet mignon, teriyaki and more. For a unique lounge experience, head to Mrs. Fish, located in the basement floor of 448 South Hill St. in Los Angeles. This swanky, modern lounge offers not only exquisite cocktails but also tasty sushi and other Japanese dishes. On weekends the bar plays dance music so feel free to hit the dance floor or lounge on one of the comfy leather couches while enjoying the food, drinks and large fish tanks on the ceiling! It’s honestly a spectacular sight. If you’re looking for a good breakfast or lunch option, head to the Famous Players restaurant, located at the historic Los Angeles Athletic Club. LAAC membership holders, as well as guests, can enjoy this upscale bistro that perfects the relaxed dining experience. With a lunch menu that rotates seasonally, there’s always something new to enjoy. Breakfast options include classics such as crepes, waffles, eggs, hashbrowns, and applewood smoked bacon.